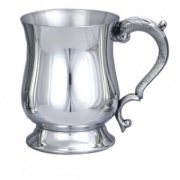 Pewter, silver plated and crystal glass tankards offered with free engraving. 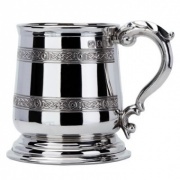 Browse this collection of quality English pewter tankards, silver plated tankards, and glass pint tankards, all ideal engraved as personalised gifts or corporate gifts, and buy online with free engraving. 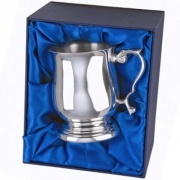 Classic 1PT straight sided pewter tankard with two line bands decoration, supplied with black card presentation box. 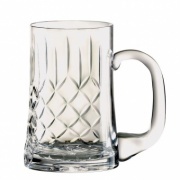 Glass pint tankard with plain body and patterned base, supplied complete with fully lined presentation box. 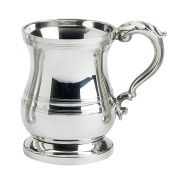 British-made cast pewter tankard with plain (undecorated) body and highly polished finish. 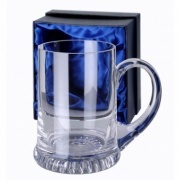 Clear crystal tankard with curved handle, star base and supplied complete with lined presentation box. Crystal tankard with cut decoration and blank engraving panel, in lined presentation box. 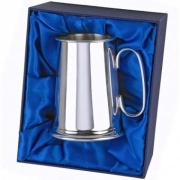 Premium quality pewter one pint tankard with polished finish, in presentation box. 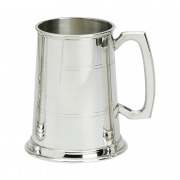 Superb polished pewter tankard, handmade by Edwin Blyde & Co., supplied boxed. Superior 1PT heavy gauge cast pewter tankard handmade in Sheffield by Edwin Blyde & Co. Supplied presentation boxed. 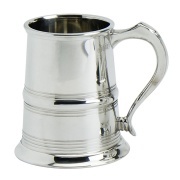 Superb handmade English pewter pint tankard, supplied presentation boxed. 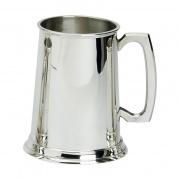 Premium quality pewter pint tankard, handmade by Edwin Blyde & Co., supplied presentation boxed. Crystal tankard with curved sides, large handle and a wide base with star shape decoration in the bottom. 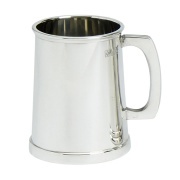 Classic plain, straight sided pewter tankard, 1pt in capacity, supplied with presentation box. 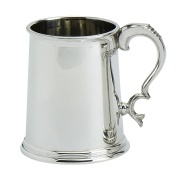 Silver plated 1PT tankard in Georgian style design, supplied with a luxury lined presentation case. 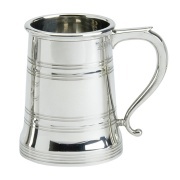 One pint straight sided pewter tankard with two Celtic design bands, with presentation box. 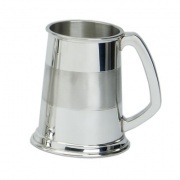 Stylish 1PT English pewter tankard with a satin band design that is ideal for engraving. 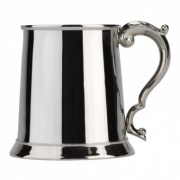 A Georgian style 1PT curved pewter tankard with ornate curved handle, supplied black presentation box. Classic fine quality English pewter tankard with two bands of celtic knot decoration, supplied boxed. 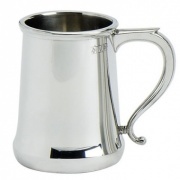 High quality one pint tankard in polished stainless steel, with Georgian style handle. 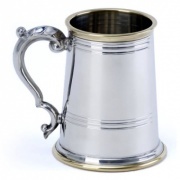 Fine quality stainless steel one pint tankard with glass bottom and Georgian style handle. 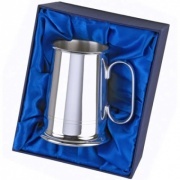 Silver plated pint tankard, hand crafted in England and supplied complete with luxury fully lined presentation box. 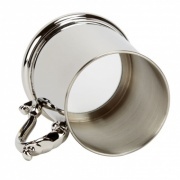 Handmade silver plated tankard with two-line decoration, in a luxury presentation box. 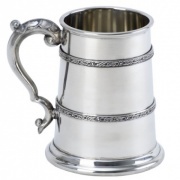 Classic 1PT straight sided pewter tankard with brass detail and ornate curved handle.